Lately, I've been feeling like I've run out of words but yet I have a lot to say. It's a spot inside The And Space I find myself in right now. This is not a photo of my frayed edges. This is not a photo of the osprey my mother and I watched as it dove three times - straight toward the ground with incredible speed - rising triumphant with a fish in its talons. This is not a photo of me asking for help. This is not a photo of me laughing out loud watching Jerry Seinfeld laugh at Dana Carvey. This is not a photo of my patience stretched paper thin but somehow I hold on. This is not a photo of the absolute joy I feel inside when I paint lines of watercolor across a page and hold my journal up to let the colors run together until I see myself reflected. This is not a photo of my mom solving the problems of the world in a dressing room at JJill. This is not a photo of 42-year-old brown eyes reflecting weariness in the mirror. This is not a photo of the best peach I’ve had in several years. This is not a photo of the moment when I had just enough space to hear the truth behind her actions. This is not a photo of her climbing onto my lap after just waking up, body warm, face soft, words kind. 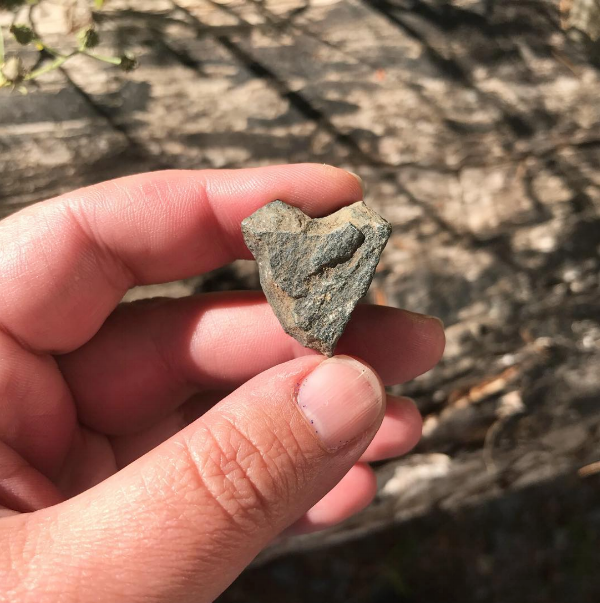 This is a photo of a heart rock we found in a driveway today, turning it over, choosing to see the sign of love. Try it today. Let the words tumble out. See what happens when you let them get unstuck. PS If you're new to this phrase The And Space, it's the name I've given to this place where we hold the beauty in one hand and the mess in the other, where we hold the joy and the grit, where we honor everything in between. I write about it here and in my newsletter.